Is this the Nikon Coolpix P6000? Nikon may have only announced a new camera just last week, the D700, but there are rumours bubbling up on the good ol' internet that the camera manufacturer is preparing a release of a new addition to its Coolpix range, the P6000. If the speculation turns out to be true, the camera will house a whopping 13.5MP sensor – a whole 1MP bigger than its newly launched DSLR. The picture of the camera leaked includes info that the camera may house and include: a Zoom Nikkor 4x grand-angle lens (28-112mm); GPS photo-tagging; and a LAN connection. 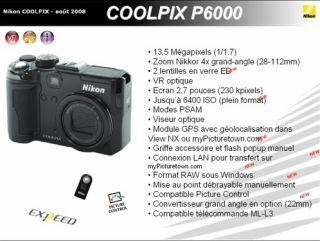 The P6000 looks likely to be the follow-up to the Nikon Coolpix P5000, which included a 10MP lens and 3.5x zoom. The rumour comes after the launch of a new Coolpix advert, which is the first ad by Nikon for five years. The star of the recent TV ad is Nikon's Coolpix S210, part of its lower-end 'style' range. If the rumours of the high-end P6000 are true, the company will probably unveil the camera at this year's Photokina, which takes place in Cologne, Germany, in September.